The Spencer Warner residence is a stone house located at 4678 Warner Road, in Garfield Heights, Ohio. It is also sometimes referred to as the Ceo house, after the family that occupied it for much of the 20th century. A wing attached to the residence houses Ceo's Bar. One also sees it referred to as the Darius Warner homestead, which will be addressed later. Spencer Warner was born in Connecticut, in 1793 (U.S. Census, 1850 and 1860) or 1797 (grave marker, Harvard Grove Cemetery). He married Sarah J. Collver (Culver? Cullver? Clover? ), presumably before 1831 (the date of the birth of their first child ((1850 U.S. Census)). Collver was born in 1801 in Canada. Spencer Warner purchased all of original lot 479, from Caleb Goodwin, Levi Goodwin, and Ward Woodbridge, executors of the estate of Horace B. Olmstead, of Hartford, Connecticut on April 17, 1820 for $400. This land, 134 acres, was on a route that was already one of the major roads through the area. (AFN 182603220001) The road, now known as Warner Road, is illustrated clearly, heading south southwest from Newburgh in the 1826 Map of the Western Reserve. Today, the approximate boundaries of this original purchase would include as the north boundary, Grand Division Avenue, the west boundary, the portion of Warner Road that runs due north-south, the south boundary, a line equal with the southern ends of East 84th and 85th Streets, and on the east with East 84th Street. This location would have been idea for a business, situated at a prominent spot between Newburgh village and the Cuyahoga River. In 1834 the Warners purchased an additional 47 acres from William Archer and his wife, the western part of original lot 480. (AFN 183404050001) This expanded eastward their holdings to a line approximately equal with East 86th Street. 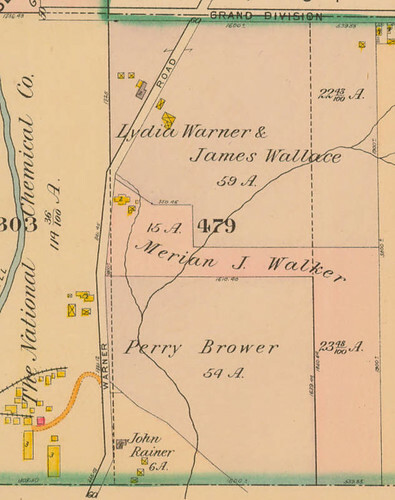 This map, from the 1898 Atlas of the Suburbs of Cleveland, Ohio, used courtesy of Cleveland Public Library, illustrates the land originally owned by Spencer Warner. His holdings included everything except the land owned by the National Chemical Company, which I left in to show the proximity of the property to Mill Creek. The gray building at the top is the house. One may note various outbuildings surrounding it. The Warners had four children: Norman S. (born 1831); Marian J. (born 1833); Lydia Ann (born 1840); and John M. (born 1841). Some have suggested that this grand house, well cited on a major road, was likely a tavern or inn. While this hypothesis sounds quite reasonable, I've been unable to locate any evidence supporting it. The 1850 U.S. Census lists Spencer Warner's occupation as a farmer. Norman Warner was working as a cooper at the time, while still residing on the Warner homestead. It seems reasonable that the Warners were, indeed, farmers, as the Census indicates, and rather prosperous ones at that. The 1856 Reports Made to the General Assembly and Governor of the State of Ohio page 524 states that Spencer Warner sold 20 bushels of apples to the Newburgh Lunatic Asylum, for a sum of $10. The 1859 issue of the same title indicates that he was paid $0.45 for 3 dozen eggs (page 171, $0.18 for 1 dozen eggs (page 175), $8.10 for 81 pounds of sausage meat (page 180), $0.75 for five dozen eggs (page 198), $15.15 for 151 1/2 pounds of ham and $10.55 for 52 3/4 pounds of butter (page 199), and $3.60 for 120 bundles of oat straw and $10.50 for 300 bundles of wheat straw (page 254). This land would have made an excellent farm, with ready transportation to market, either locally, in Newburgh, or via the Ohio and Erie Canal. The slope of the land was gradual, and the streams would have provided sufficient water for animals. By 1860, Norman had moved out of the house. Lydia was listed as being a student, which was unusual, given her age and the time. Presumably, this would have been in an institution of higher education, perhaps Oberlin College. By this date, Miriam had married James Walker, a Scottish stonecutter, born in 1828. They had already had one child, John. They would remain in the Warner residence for several decades. There are several other individuals with professions relating to stone quarries listed on adjacent pages of the 1860 U.S. Census. It seems likely that Walker came to the area because of the availability of work in the quarries. As of 1870, Lydia Warner remained in the house built by her parents, as did James and Miriam Walker. John M. Warner had moved out by this date. The Walkers had had two more children, Maggie (born 1862) and Ulysses (born 1865). The farm remained prosperous. The Census lists two additional residents: James Bingham, a farm laborer from Ireland and Sophia Gardner, a domestic servant from Baden, Germany. James Walker died January 24, 1897. He was buried in Harvard Grove Cemetery. (Cleveland Necrology File) Miriam died on November 4, 1905. A funeral was held on Monday, November 6, at Miles Park Presbyterian Church. Lydia Warner died July 12, 1906, at the Cleveland State Hospital. (Cleveland Necrology File) She was buried in Harvard Grove Cemetery. There's just one problem with this - another source disagrees. In The Darius Warner Homestead, a chapter in Recollections: A Collection of Histories and Memories of Garfield Heights (Garfield Heights Historical Society, 2003), Dan Ostrowski presents a different picture. Mr. Ostrowski used early tax records, which show, as of 1816, that as of 1816, 100 acre lots 471 and 479 were owned by William Stockwell, a non-resident. He states that Darius Warner, Jr., his wife Delilah, and their five children, Spencer, Lydia, Sarah, Miriam, and Norman all came to Newburgh Towship from New York and were residents of the aforementioned land as of 1818. The back taxes were abated, and the taxes for that year were $1.82. In 1820, the taxes jumped to $3.185. Mr. Ostrowski suspected that this was because of the construction of the house that year. He also indicates that the stone for the Warner residence was likely quarried from the area near Mill Creek Falls. I had hoped to contact Mr. Ostrowski to clarify some of these items, but learned when I tried to do so that he died in 2005. 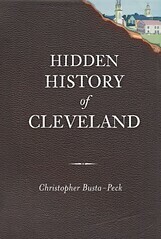 Norm Braun, historian at the Garfield Heights Historical Society, informed me that the information for the entry was based primarily on the tax record duplicates, located in the Cuyahoga County Archives. I have not had the time to get to these records to verify the information. The first U.S. Census record that I have for Spencer Warner is in 1830. There is one other person in his household - most likely Sarah Warner. The 1820 U.S. Census does list a Darius Warner in Newburgh Township. There was one other person living with him, presumably his spouse. It also lists a Darius Warner, Jr., with two other members in the household - a wife a child. The 1830 Census also lists a Darius Warner in Newburgh Township and one in Beford Township. A grave marker for Darius Warner, in Harvard Grove Cemetery, indicates that he died on June 24, 1842, at the age of 72 years. Further, it is noted that he was father of Darius Jr., Lydia, and Esther. I have not been able to find any records of Darius Warner, Jr.'s death. The dates given for his life, however, do not coincide with those that would be reasonable to expect him to be the father of Spencer Warner. I haven't been able to determine the exact familial connection between Darius and Spencer Warner. It's obvious that there is one - they share a common burial plot at Harvard Grove Cemetery, and they were living in the same area at the same time. I also disagree with Mr. Ostrowski's assertion that the stone was quarried from the area near Mill Creek Falls, a distance of almost 3/4 of a mile away. 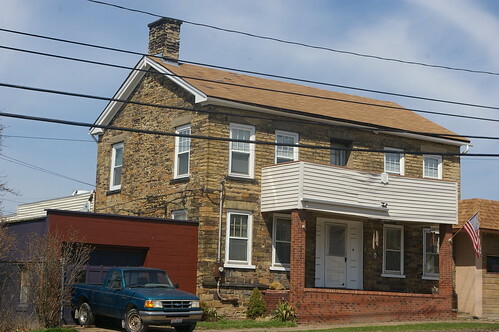 As Roy Larick indicates in this Bluestone Heights article, early stone structures were usually built because stone was readily available in the area. It seems more likely to have come from the outcrop just to the west. 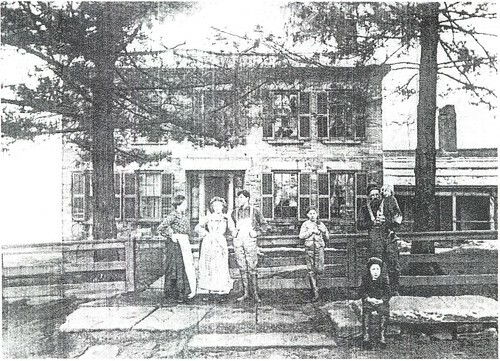 Adam Reiber and his family used the property as a residence in the 1890s, according to Ben Ostrowski's article. They are pictured here, c. 1895, in this photo, used courtesy of the Garfield Heights Historical Society. The image is reproduced from Recollections: A Collection of Histories and Memories of Garfield Heights. Adam Reiber is on the right, with a child in his arms. It seems that they rented the house, as I cannot find any record of the transfer of the property to them. The house was purchased in 1915 by Antonio and Pasqua Ceo, who operated it as a cafe and bar for many years. Pasqua and Antonio Ceo used the house as their personal residence as well, until their deaths in 1939 and 1958, respectively. (Cleveland Necrology File) It remained in their family until 2006 (AFN: 200602230712). What do we know about the house itself? It has a different feel from the other pre-1860 stone buildings that I have written about: the Edwards and Honam houses; the Preyer house; and the Luster Tannery. It feels, to my eyes, like something with more of a Pennyslvania influence to the construction. The basic form of the house has remained the same over time. A stone ell that went off to the side, parallel to the road, pictured in the historic photo above, was removed sometime between 1915 and 1950. During the same period, the second floor window was turned into a door and the porch added. A second chimney, shown in the historic photos, was also removed at some point. While many of the windows are replacements, they are of the same form, six over six, as the originals. Shutters, now lost, covered them historically. 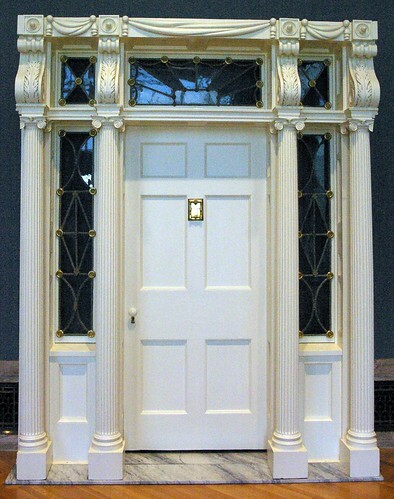 The original front doorway bears a slight resemblence to that of the Isaac Gillet House, built c. 1821 by Jonathan Goldsmith. Remove the transom and outer columns, replace the leaded glass with standard panes, and you have something that looks very close to the doorway illustrated in the historic photo. How old is the house? It's hard to be sure. I've looked and looked for some concrete evidence, but have been unable to locate any. We know that the house was built between 1820 and 1860. Further, we know that Warner was living on this site - we just don't know whether it was in this structure or in an earlier house that this one replaced. A house of this size and quality represents a significant investment of labor and time. Would a farmer in his position have either when dealing with what was likely forested, untilled land? 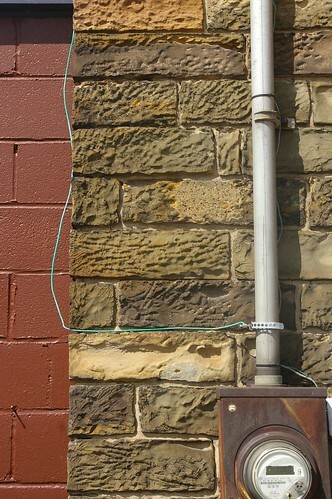 The quality of the stonework, shown above and in this photo, is more refined than in the Honam, Edwards, or Preyer residences. The tool marks, however, are rougher, suggesting earlier and more primitive instruments used in the quarrying. The pitch of the roof is closest to the Honam residence, suggesting an earlier date of construction. The style overall would lead me in that direction as well. As for an exact age, alas, I don't have much evidence. We can say that it appears earlier than many of the buildings discussed previously. This is an interesting and historically significant structure. It represents the efforts of an early farmer to make a place for himself within his community. The house, on a prominent transportation route, represents the collision of an agricultural society with an early industrial one. I noticed a "For Sale" sign in the window. I hope, when it sells, that the new owner continues to give this landmark the care it deserves. Having grown up in Garfield Heights, I've always wondered about this house. My grandmother lives just diagonally from it, on Garfield Blvd. it's great to read about the history of the place! 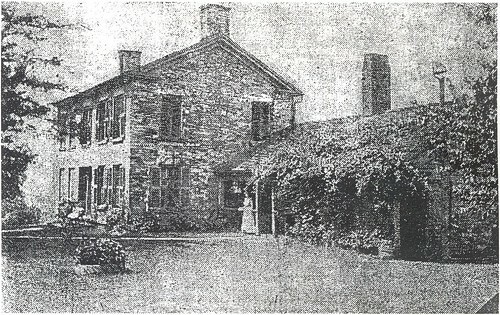 The historical photos show the Warner house to be a significant building for its time and place. Now, nevertheless, Warner represents an early, large Western Reserve stone house that survives with little associated lore. Downright curious that such a landmark does not have an arguable construction date. You’ve helped to rekindle the story. The house does resemble Lakewood’s Honam and a couple other stone houses built there during the mid- late-1830s. The Warner wing was very large. The wing chimney has at least two flues, suggesting a substantial kitchen fireplace and at least one other hearth. The wing may have held several rooms for food processing and laborer residence. With the building of the nearby Lunatic Asylum in 1855, one wonders if the Warner farm took on a provisioning role for that institution. Inn-keeping remains a possibility. Newburg lay on the road to Pittsburgh. The 1898 map shows the John Rainer house at the south end of the original Warner land holdings. Also built of stone (but now demolished), Rainer may enter into the Warner story. At Newburgh, Mill Creek cuts through the Euclid bluestone, the only immediately local sandstone. Both Warner and Rainer lie just above the bluestone bed in an area known to have been quarried since the 1810s. Christopher’s close-up photos show a material of fine grain, much like that of Euclid bluestone. 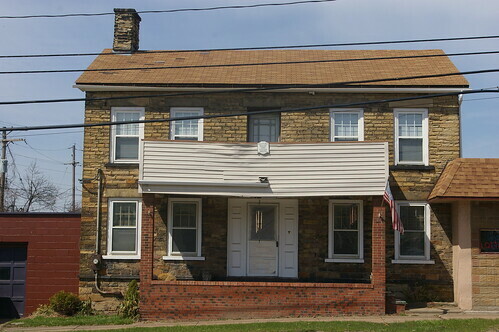 The Warner house may uniquely represent the Euclid bluestone as a local building material before the Civil War. Great work Christopher--I love the quarried stone and the photo that shows the house with shutters, when shutters still had a function on homes. Could you put your skills to work on a life history for Henninger House on Broadview Rd? West Creek Preservation Committee has done a lot of leg work, but you bring a certain poetry to the story. That sounds like an interesting prospect. Do you know anyone who might be able to provide me access to the interior? I think that images of the inside would really help to tell a compelling narrative. I wonder how much they are asking for this house ? I own a 90 year old home in Garfield. I love the area !!!! I wish more people would see the beauty of Garfield Hts and Maple Hts. 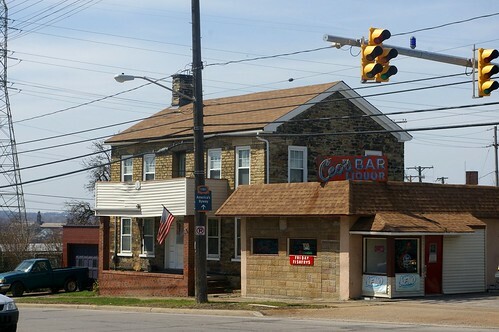 The current owners paid $200,000 for the property in February of 2006. I'd guess that they're probably asking something in that ballpark. I'm not sure how hard liquor licenses are to obtain there - if one was interested in converting the property back to a private residence, perhaps it could be sold/traded to offset the initial cost? I doubt if they could get 20k for this property now. The neighborhood is in decline.